The erstwhile peaceful Swedish capital, Stockholm has seen rioting for 5 consecutive nights, what could be the cause? 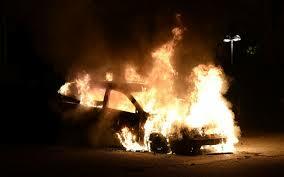 Police in Stockholm are to seek reinforcements after youths set cars ablaze and threw stones at police for a fifth night running, officials said. About 30 cars were set on fire in poorer districts in north-western and south-western parts of the Swedish capital on Thursday night, with rioters causing widespread damage to property, including schools. However, a police spokesman said the overnight violence was less intense than in previous nights. Despite Sweden's reputation for equality, the rioting has exposed a faultline between a well-off majority and a minority, often young people with immigrant backgrounds, who cannot find work, lack education and feel marginalised. "In terms of extent, it is a little less, a little quieter," said the police spokesman, Kjell Lindgren. Eight people, mostly in their early 20s, were detained during the night. He said police planned to request reinforcements from other areas to help deal with the rioting as well as upcoming football matches and the wedding of Princess Madeleine, third in line to the throne, on 8 June. He said the police needed to be prepared to maintain a heavy presence on the streets. "We will do that for days, weeks, as long as it is necessary," he said. The violence appears to have been prompted by the death of a 69-year-old man shot by police this month in Husby, now the centre of the rioting. One recent government study showed that up to a third of young people aged 16 to 29 in some of the most-deprived areas of Sweden's big cities neither study nor have a job. The gap between rich and poor in Sweden is growing faster than in any other major nation, according to the OECD, although absolute poverty remains uncommon.